In 1985, while studying at Harvard, I discovered that I had dry eye syndrome (DES). I knew from my college days in Japan that my eyes soon tired and easily became bloodshot. However, even after becoming an ophthalmologist, I never noticed that I myself had DES. Since that discovery, I have involved myself in the clinical, research, and public awareness facets of this syndrome. Then came the delightful news. An ophthalmological journal published its spring 2013 ranking of dry eye researchers worldwide and, to my surprise, I was at none other than first place! The evaluation referenced 190 publications I authored or co-authored in peer-reviewed journals over 27 years. With a recent finding that vision deteriorates as a result of DES, I will rededicate my efforts to clarifying the pathology of this disorder and developing remedies to relieve it. The Elsevier Pure assessment of all Keio researchers ranks Prof. Tsubota 3rd among his peers, with an h-index of 74 (as of March 31, 2017) and citation index of 23,969. The Asia Dry Eye Society published their first consensus paper in The Ocular Surface. June 26 - 27, 2015 New York Blue Light Symposium has successfully ended. Dr. Tsubota served as chair of Asia ARVO 2015 - It was great success. DECS-J Study Group. 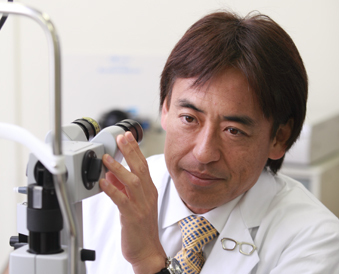 A Clinic-based Survey of Clinical Characteristics and Practice Pattern of Dry Eye in Japan. Adv Ther. 2017 Mar;34(3):732-743. doi: 10.1007/s12325-017-0487-x. Asia Dry Eye Society. New Perspectives on Dry Eye Definition and Diagnosis: A Consensus Report by the Asia Dry Eye Society. Ocul Surf. 2017 Jan;15(1):65-76. doi: 10.1016/j.jtos.2016.09.003. Epub 2016 Oct 8. Review. Sleep and mood disorders in women with dry eye disease. Sci Rep. 2016 Oct 12;6:35276. doi: 10.1038/srep35276. Reducing Short-Wavelength Blue Light in Dry Eye Patients with Unstable Tear Film Improves Performance on Tests of Visual Acuity. PLoS One. 2016 Apr 5;11(4):e0152936. doi: 10.1371/journal.pone.0152936. Relationship of Corneal Pain Sensitivity With Dry Eye Symptoms in Dry Eye With Short Tear Break-Up Time. Invest Ophthalmol Vis Sci. 2016 Mar;57(3):914-9. doi: 10.1167/iovs.15-18447. Randomized, Multicenter, Double-Blind Study of the Safety and Efficacy of 1%D-3-Hydroxybutyrate eye drops for Dry Eye Disease. Sci Rep. 2016 Feb 11;6:20855. doi: 10.1038/srep20855. Dietary Supplementation with a Combination of Lactoferrin, Fish Oil, and Enterococcus faecium WB2000 for Treating Dry Eye: A Rat Model and Human Clinical Study. Ocul Surf. 2016 Apr;14(2):255-63. doi: 10.1016/j.jtos.2015.12.005.